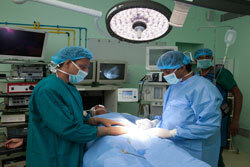 NU Hospitals was started in July 1999 as a superspeciality hospital for nephro-urology care. We are one of South India’s leading nephro-urology hospitals and Karnataka’s first dedicated nephro-urology centre. Many of our professionals have been a part of Karnataka’s first nephro-urology centre, for more than 20 years. A large number of our medical professionals have worked in the field of nephro-urology for over two decades, continuously keeping pace with advances in a field that is progressing rapidly. All this has resulted in us gaining a high level of experience, knowledge and expertise in providing quality nephro-urology care – quality care that is further ensured though our strengths, which include our experienced professionals, state-of-the-art technology, strict adherence to quality protocols at all levels, and cutting-edge research, just to name a few. This, in turn, nurtures an excellent quality of life, so fulfilling our promise to you of ‘Making Life Meaningful’.